Scooper - Technology News: How can businesses support mother and child health in Kenya? How can businesses support mother and child health in Kenya? The world is getting increasingly complex and fast-moving. As an organization seeking to have impact, the United Nations Population Fund (UNFPA) has to stay nimble and adapt to new realities. One key element of these efforts is innovation. UNFPA’s vision of a world where every pregnancy is wanted, every birth is safe and every young person’s potential is fulfilled is a grand ambition, but it is driven by thousands of people around the world, working tirelessly to make it reality. The obstacles in the way of achieving this vision are too complex for any one sector to face alone. So we need innovative approaches to our programming and in the way we engage with partners such as the private sector. Under the able leadership of the Government of Kenya, UNFPA has teamed up with the World Economic Forum under the initiative Health Systems Leapfrogging in Emerging Economies . We found an exciting opportunity to push the innovation agenda even further. On 26 September 2015, Kenya saw the global launch of the new Global Strategy for Women, Children and Adolescent Health . At this event, hosted by UN Secretary General Ban Ki-Moon, President Uhuru Kenyatta expressed a strong commitment to improving healthcare for women and young people in Kenya. The private sector didn’t disappoint either: Safaricom, Philips, Merck Sharp & Dohme, GlaxoSmithKline, Huawei and Kenya Healthcare Federation all committed to join forces with the strategy and collectively target maternal, adolescent and child health interventions in six counties with a rate of close to 50% of all maternal deaths in Kenya. This public-private joint commitment, spearheaded by the Government of Kenya and UNFPA, is very much in line with the spirit of the new Sustainable Development Goals : leaving no one behind by addressing health inequities. Within this initiative, partners are exploring ways to combine the unique expertise and services of Safaricom, for example, to improve health systems through ICT; and to use the support of MSD to promote innovation and entrepreneurialism in health services. 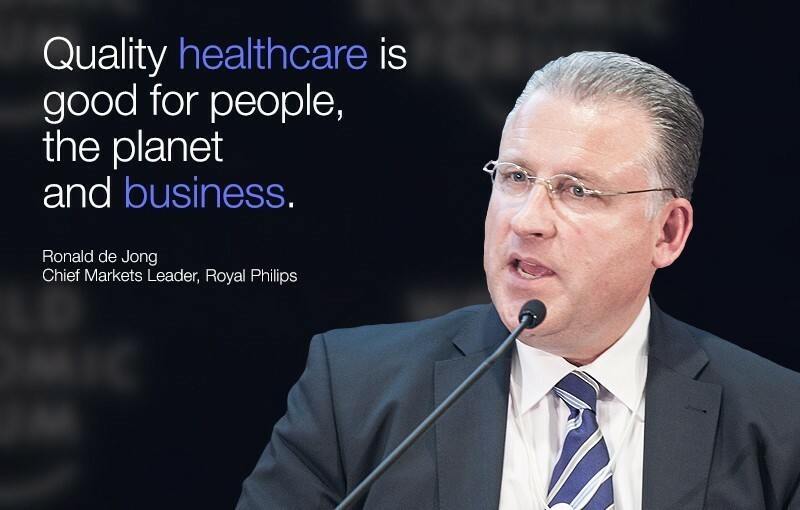 In 2014, Philips opened its first community-owned health centre in Kenya: the challenge for partners now is to scale the model for low-resource settings. Partners are committed to significantly improving health outcomes in the target counties, while also creating business opportunities that have a social as well as economic return on investment. These activities illustrate how “leapfrogging” could work at the micro level, where we focus on changes in specific parts of the health system in Kenya. But through the partnership with the Forum, we are also defining ways to leapfrog on the macro level. This is done through public and private sectors discussing how to strengthen and finance health systems. This includes exploring blended financing vehicles in alignment with the Global Financing Facility led by the World Bank. Committing to innovation as part of the way you operate as an organization, is both an exciting and daunting endeavor. Deciding to look for new ways to solve problems and challenges creates a momentum that can galvanize the team to put in an extra effort. But it also requires a willingness to enter uncharted territory. It requires a willingness to leave the comfort zone and acknowledge that trial and error is the best way to innovate solutions. In UNFPA, we are tasked with demonstrating value. This means that we constantly have to be ready with alternatives, if a solution or a project does not succeed. The best way to do that is by surrounding ourselves with brilliant minds and different outlooks, including that of the private sector. That is why we value our partnerships and the results we are able to create through them. Partnerships are key to our shared leapfrogging efforts and will require revolutionary thinking and action.